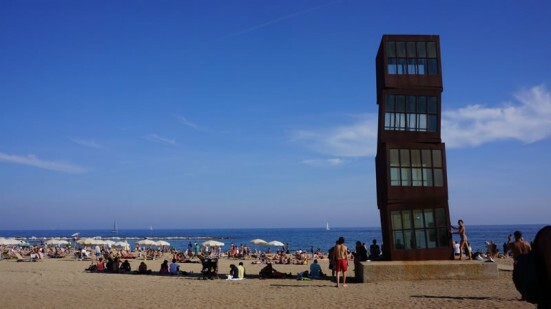 After I met my friend we grabbed a drink in the back streets of Barceloneta, an area which would soon become a real favourite of mine, and decided the only thing to do as a new visitor to the city was to head to the beach and jump in the sea. We quickly stripped down and threw ourselves into the water diving in and out of the waves. At one point I turned back to look at the city around us and felt a further sense of adoration for the place. Something about being in the water surrounded by the throngs of a city, but more than that, a sense of energy from the place that I couldn’t quite place yet. I felt it had welcomed me with open arms instantly. No judgement. That night we bought some beers and went to hang out with the other revellers in Plaça de George Orwell. The place was flooded with students sat on the paving slabs and drinking cervezas. Men came around with plastic bags selling cans of beer and boxes of samosas. It was September and the air was heavy with a city sweat. It was 10pm but people were only starting their evening. The next day I woke up and decided to explore the Born district. In this part of the city the streets felt damp. It felt timeless. I could as well have been walking these streets 60 years ago to the same tune. Like many old quarters of a city, this area had fallen foul to selling its soul for tourism, but there was also a sense of it being lived in and enjoyed by the locals. I put on my headphones and just walked. This area, along with the Gothic quarter, has since become a real joy to me due to all its hidden gems just off the main streets. El Nus (c/ Mirallers, 5) and Cala del Vermut (c/ Magdalenes, 6) to name just a few. I continued on my walk and before I knew it I could make sight of the sea again. The midday sun was shining and the clear blue sky was framing the vibrant beaches. I came out of the old quarter and on to fresh, new pavement. I later learned that the beaches of Barcelona are still a very recent acquisition. As with much of the city’s development, they came about as a result of hosting the Olympics in 1992 and have only added to the city’s eclectic and appealing mix of old and new. I made my way past the port, walking alongside the cyclists and skateboarders, and soaked up the smells of the restaurants lining the Passeig de Joan de Borbó. The beaches were packed, full to the brim with tourists and locals. I sat down on the sand and once again realised why so many people love this city. 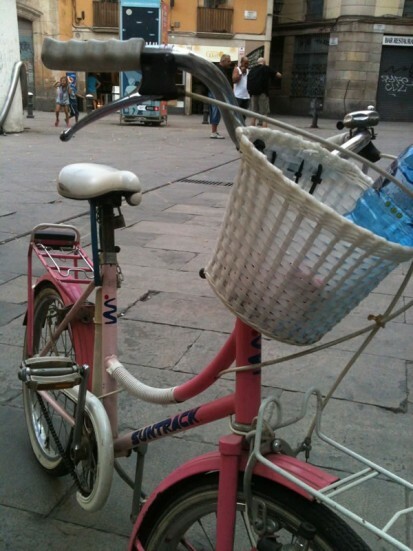 These days I often cycle down on my friend’s little pink bike from where I often stay near the Sagrada Família, down through Passeig de Sant Joan, and make my way through the city by bike. You can cycle on the pavement here and no one cares. Realising that just increased my love for the place tenfold. In the evening I made my way up to the district of Gràcia to meet friends for dinner. When I got out of the metro at Fontana it felt like I was stepping out in to another city all together. 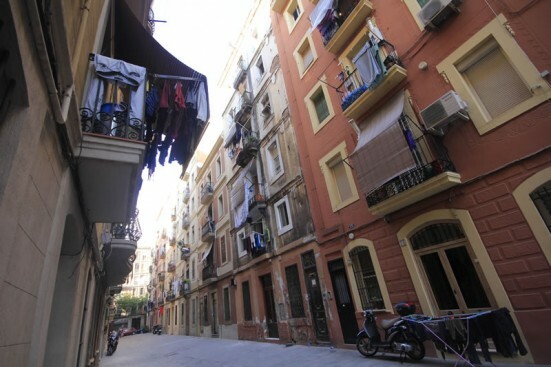 Gràcia is in the northern parts of the city and was an independent municipality until it was annexed to Barcelona in 1897 which might explain its more independent feel. People who live in Gràcia tend to work there also. They rarely leave, and I can see why. It has the vibrancy of being part of a thriving city but the charm of a small town. We started off at Bar Diamant (c/ Sicilia, 228) where I have since spent many evenings over beers and patatas bravas sharing tales of the city. For dinner we went on recommendation and were told about a typical Catalan place a few streets away. We ran through the rabbit warren of streets that make up Gràcia and found the very charming Taverna El Glop (c/ Sant Lluís, 24). Arros Negre was on the menu and I was desperate for it by now and it went down a storm. I still remember it as one of the best. 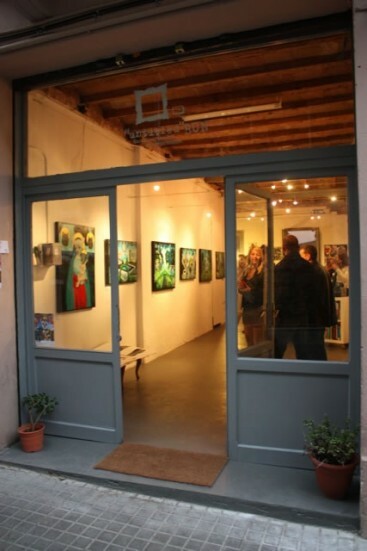 These days Gràcia is certainly my ‘home’ district, similar in a way to my other life back in Hackney, London. If I’m lucky enough to get a table then I’ll head to ‘Restaurante Shhh… no se lo digas a nadie’ (c/ Torrijos, 53) for their delicious Argentinian quiches and certainly the best patatas bravas I’ve ever had. On my visit those four years ago I met up with a friend’s cousin who gave me a bit more of a run-down of the city, the areas and its green spaces. She told me about the magical Montjuïc gardens, Tibidaboand much more. I was eager to get back out on the streets again and when she heard I was an artist she told me my first visit must be to see some of Gaudí’s buildings. I can so vividly remember the first time I set eyes on the Casa Batlló. It was sort of by chance. I was walking down Passeig de Gràcia gazing in to the shop windows full of lavish and over priced designer wares when I realised right there, in amongst all of this ugliness, was one of the most profoundly beautiful and simply extraordinary buildings I had ever set my eyes on. It was, simply put, like nothing I had ever seen before. I remember being in awe of its boldness and yet subtle ability to blend in all at the same time. I’ve never had the inclination to want to touch a building before but with this I just wanted to press my cheek up against it and wrap myself around its curves. The rounded contours of its interior and exterior allowed you to literally mould yourself in to its shell. Needless to say that after a good thirty minutes just sitting on the pavement and staring up at the Casa BatllóI realised that the switch had been flipped on and I was ready to draw. 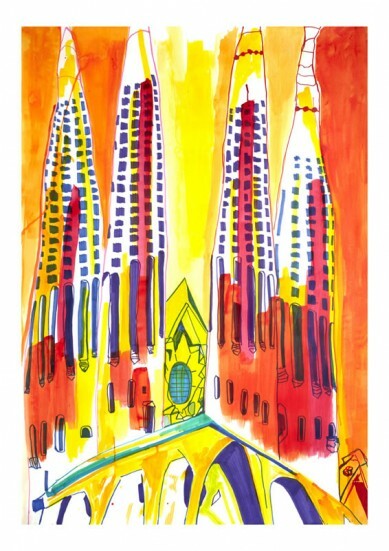 The next day I came back laden with pencils and pads and so it began, my love affair, my drawings to Gaudí. They started there. They never stopped really and I don’t think they ever will. Hours go by, usually with music on, where I find a spot on the street and just draw. Never before have I been able to lose myself in the beauty of something so intently. Laurie Nouchka is a visual artist who lives between London and Barcelona. Her work primarily centres around drawing but increasingly it is realised through collaborations with other artists and includes work ranging from painting and drawing to video, installation and performance. She is currently developing a piece of work that focuses on the past, present and future of Catalonia, her current adopted home. It was born out of an interest in the Catalan culture and identity which was seeded the day she set foot in BCN 4 years ago. She will collaborate with various artists creating an audio-visual response to her subject which she plans to stage in the plaças around BCN. Set to be presented in 2013, the progress of this piece will be exhibited both on and offline along the way. 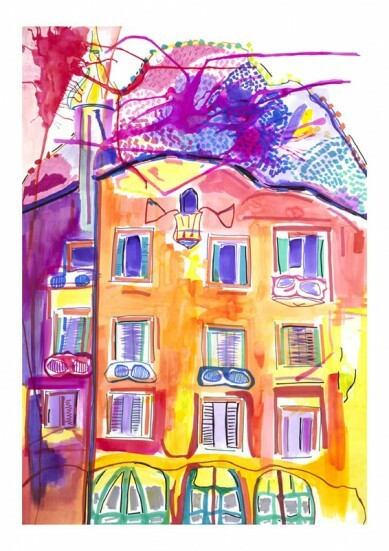 Visit her website at www.laurienouchka.com. Or on Facebook or Twitter.